Home » Music » Did Lady Gaga’s ARTPOP Album Cover, Tracklisting + Song Leak!? Did Lady Gaga’s ARTPOP Album Cover, Tracklisting + Song Leak!? All my friends have been asking me, what happened to Lady Gaga? During her “Born This Way World Tour”, the “Bad Romance” singer suffered a labral tear on both of hips causing her to go on a six-month hiatus. Because of this injury the pop singer was forced to cancel or postpone all activities including her album, ARTPOP, which was due this summer. Lady Gaga is now in excellent condition and has been spotted almost daily, looking not only better as ever but irregularly, regular! Little Monsters everywhere highly anticipate Mother Monster’s return, as she gets ready for the release of her upcoming album! Yesterday, the album’s “cover” and “tracklisting” leaked . . . notice the quotes. 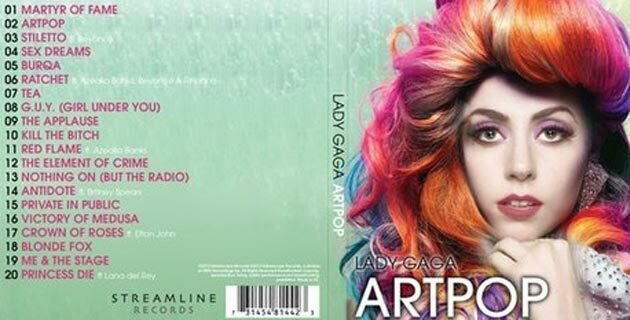 The album’s cover is all green and features Lady Gaga wearing a rainbow wig. The tracklisting includes familiar songs such as “Ratchet” ft. Beyonce, “Artpop” and “Die Princess” while other collaborations include Azaelia Banks and Elton Jon. Additional to the leaked album cover and tracklisting was a snippet of track “Feel It” which was not listed on the supposed tracklisting. While these leaks are exciting, I don’t believe that they are real, the album cover is so amateur compared to previous album covers. However if it is real, monster, prepare for Gaga’s takeover! Check out the 45-second snippet of “Feel It” below!